Tempur-Pedic mattresses are made from a viscoelastic, temperature-sensitive foam that was originally developed by NASA for the space program. The mattress conforms to your body, relieves pressure points and provides equal temperatures. Because the material is different from ordinary mattresses, there are some special care instructions you'll need to follow. If your mattress is delivered folded, don't force it to lay flat, especially in weather below 50 degrees Fahrenheit, as it will naturally unfold as it warms up in a few hours. 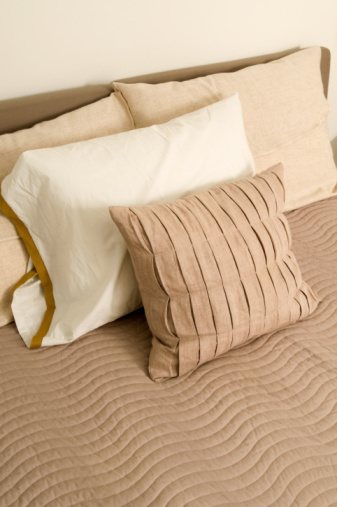 Tempur-Pedic mattresses undergo an adjustment or "softening" period, which is normal. The materials are temperature sensitive, so very warm and humid weather may make the mattress feel soft, while very cold weather may make it feel firmer. The Tempur-Pedic should always be placed on a firm, flat surface, not a box spring, waterbed frame or futon frame. Placing the mattress on an unapproved surface will not only make the mattress sag and show indentations, it will void your warranty. Due to the temperature sensitivity of the material, the manufacturer doesn't recommend using an electric blanket or heating pad with your mattress. You should also avoid conventional mattress pads or mattress covers as they can affect the pressure-relieving benefits (although they won't hurt the mattress or void the warranty). Your mattress should also never be flipped, as it has a one-sided design. If your Tempur-Pedic mattress should become stained, take care to not drench, soak or wash the actual mattress, and especially avoid bleach and harsh stain removers. One thing you can try is to sprinkle some dry baking soda on the stain to remove odors. However, you can remove the mattress cover (unzip it if you have that type) and wash it with cold water and a mild bleach-free detergent, and allow it to air dry or machine dry on a very low setting. Note that the official warranty doesn't cover protectors that are abused or not handled per laundering instructions (or are commercially laundered) or stains caused by nonfood-related grease, inks, cosmetics, bleach, alcohol, dyes, solvents, corrosives, sides of mattress, linens, foundation, boxspring or mattresses not using a protector. For Tempur-Pedic pillows, fluff them by simply rolling them up like a sleeping bag, let go and repeat with the other side. If you have regular pillow covers, you can remove them as you did with the mattress cover and wash them in cold water and line dry. Note, however, that the cover for the GrandPillow by Tempur-Pedic is dry clean only. Any additional questions about mattress or pillow care can be sent via the Tempur-Pedic Customer Service link on their website, Tempurpedic.com. If you aren't concerned about voiding the warranty or if the spill or stain on your mattress is so horrendous that the manufacturer's care instructions can't help, you might consider some alternatives. For instance, if it's a mattress topper and not a full mattress, try washing it on a gentle cycle with mild soap but avoid the wash cycle and push the mattress down by hand, then skip to the drain/rinse and spin cycles. For full-mattress stains, try dampening the spot and sprinkling borax over the area, allowing it to sit overnight, then vacuum (note that borax is toxic if ingested, so keep away from small children or pets). Another alternative is to use vinegar in a spray bottle for stains, or a steam cleaner for mattresses that become drenched. For odors such as urine, you can try an enzyme-based cleaner from a pet supply store.